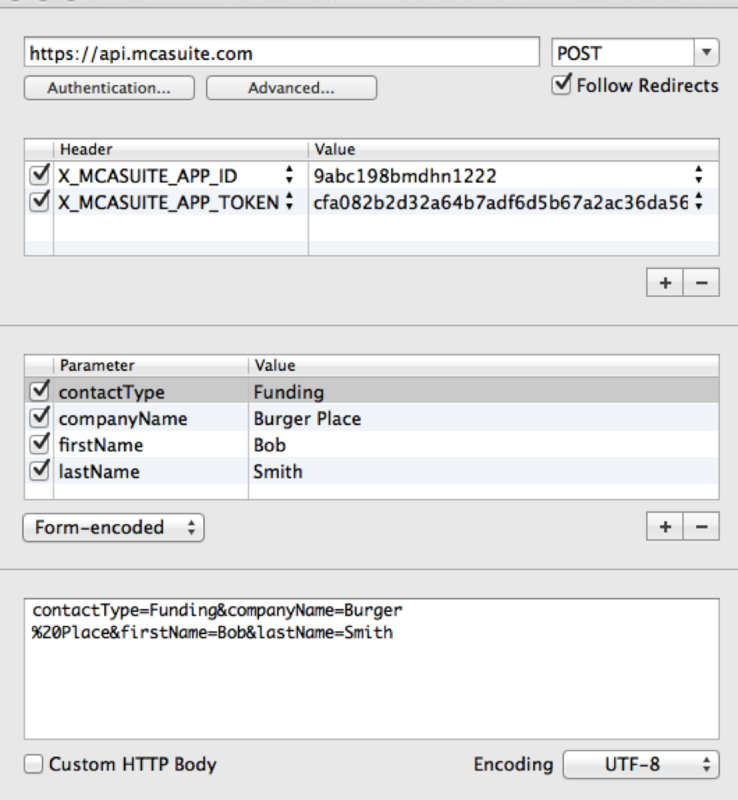 The MCASuite REST API allows companies to integrate into MCA Suite system through a HTTP RESTful web service. The API is designed to ease the painful process of hand entering data from one system to another system. All responses will be in JSON format. 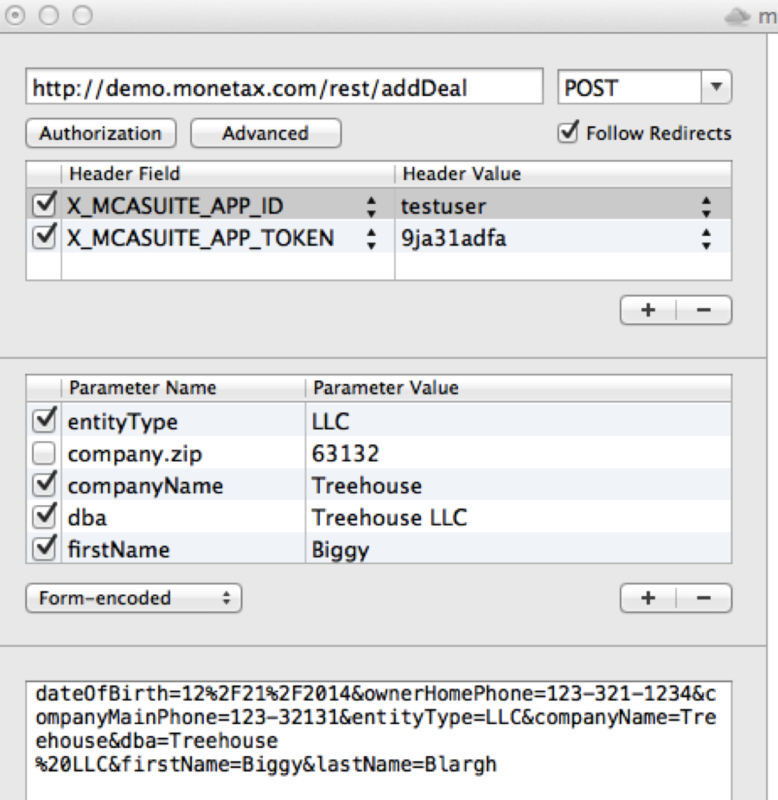 Currently, there are two api methods: Add Contact and Add Deal. Both of these values will be generated by MCA Suite and provided to our customers. Please contact your representative to get these credentials. The Base REST URL will be provided to the customer upon API request. The API will accept form encoded or json encoded parameters. To test the rest url and parameter, we recommend to use the Rested app on Mac OS. Alternatively, you can use the “Advanced Rest Client” extension on google Chrome. If using the Chrome extension, please verify you use application/json as content type, and paste the json parameters into the Raw tab. When adding a contact through the REST api, the contact will appear in the 'Pending Contacts' page in MCA Suite. If none provided, the default contact status setup in Admin will be used. and bypass the Pending contacts page. // Check out response message, it will be in json format. Company address zip code, only valid 5 number zip – 4 digit extension. homeBusiness String - Max 20 Is it home based business? String This is the username (email login) of a MCA Suite user. The system must have the user in MCA Suite in order for the record to be accepted. Permissions on the deal will automatically be set to this user. String Match campaign name in Admin - Application configuration. String Must be set to “true”. This will automatically send it through from pending to accepted. You must contact MCA Suite to setup this feature. Only if autoAdd is used then the response will include the URL of the deal summary page for new deal. Number Only if autoAdd is used then then the new deal id will be returned.